In the hilly little town where I live, we are very lucky to have a fresh food market by the waterfront every Sunday morning. 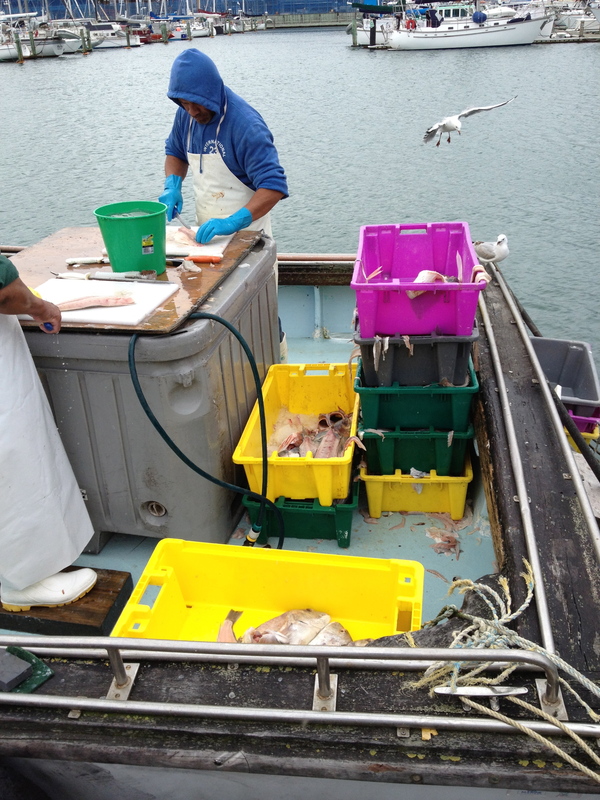 And one of the highlights of this market is the fresh fish boat. It parks up on a jetty near the market and shoppers can purchase a range of freshly-caught ocean treats of their choosing. 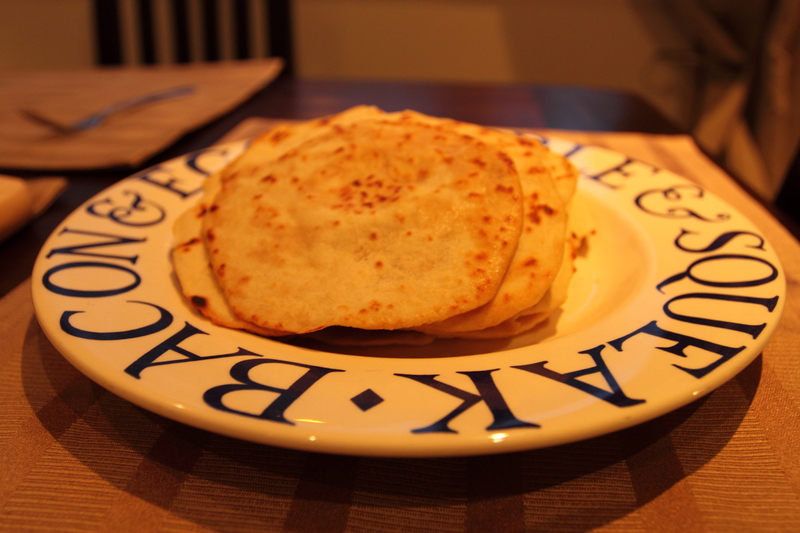 A few months ago, we experimented with home-made tortillas for tea. They’re not too difficult to make and are truly delicious hot from the pan, the same kind of satisfying deliciousness as hot home-made bread. And as I stuffed them into my mouth, it occurred to me that these mouthfuls of hot and floury deliciousness would be even better with a nice slab of fresh fish. Not that I am at all squeamish about dead animals in their natural state, which is surprising for someone who was a committed vegetarian for the best part of ten years (no longer…sorry Mr Fish). The Mr on the other hand is a committed carnivore and comes over all funny at such sights, therefore I am definitely the person who deals with bones and scales. But I digress. To cook this lovely little fish, we…. Put the oven on nice and hot, about 210 degrees and above. Added a couple of tablespoons of olive oil, a sliced fresh chilli, ground coriander and lime juice. Cooked it for about twenty minutes. While Mr Fish roasted away, we got the tortillas organised. I used the Destitute Gourmet Sophie Grey’s Frugal Flour Tortilla recipe. This involves combining 2.5 cups of flour and a teaspoon each of salt and baking powder, and then adding 3 tablespoons of olive oil. Gradually add 3/4 cup or thereabouts of warm water until you have a soft dough. Knead the dough for five minutes on a floured board, rest it for a while if you have time, and then divide it into 12 balls. Roll these out and cook in a hot frying pan with a little oil, first one side until is bubbles and browns, then flip it over for another 30 seconds or so. I am ashamed to admit I don’t own a rolling pin, so we used my jar of long grain rice to roll out our tortillas. I suspect this may be the reason they were a little small and misshapen. Fortunately this did not affect their taste. To serve, we scooped spoonfuls of the roasted fish into the tortillas, along with some salad leaves (for appearances), mayonnaise and tabasco, and shoved them into our mouths with the juices dribbling down our chins. If this is not an effective way to beat the Sunday-night blues, frankly I don’t know what is.